Want to become a better point guard? Below are some of the best and most effective basketball drills for point guards because they will help improve your ballhanding skills, passing, dribble moves, shooting, footwork, and decision making. All critical skills to become a better point guard! Many of these drills are used by NBA players! 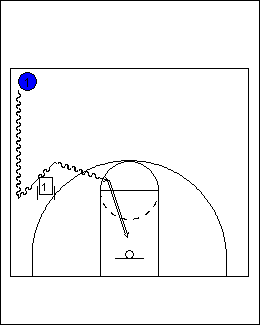 In fact, we got all of these drills from an NBA development coach (Don Kelbick). He works with players like Raja Bell, Bruce Bowen, Carlos Boozer, and many other NBA players. Most of the drills below incorporate a combination of skills. 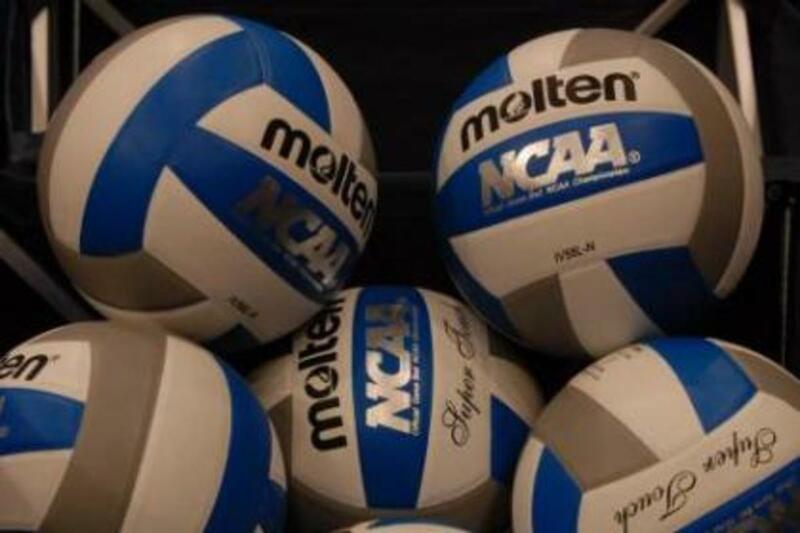 Use your imagination to determine where they fit in to your game. These are just samples. 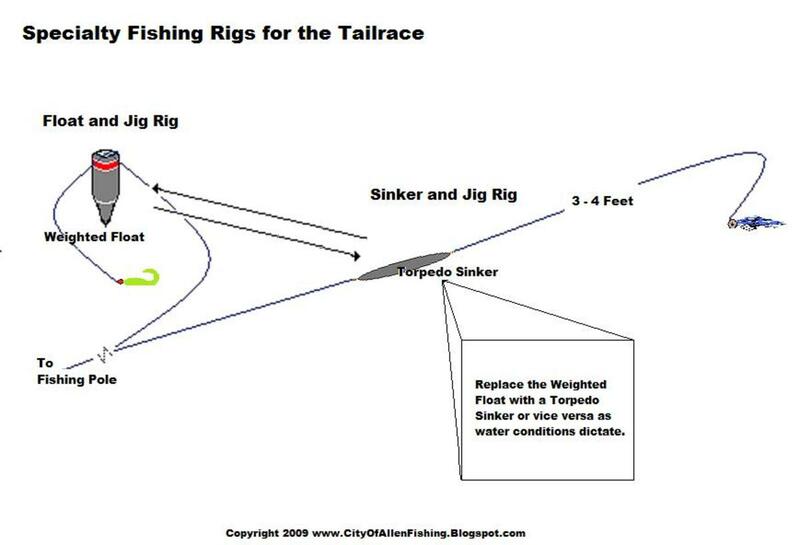 Set-up can be anywhere to the approximate areas you want to improve. 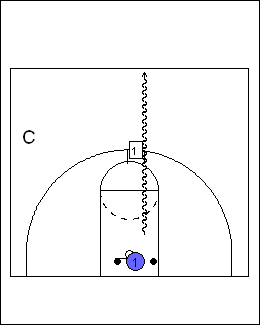 This is a very challenging drill that addresses ball handling, ball control and shooting. 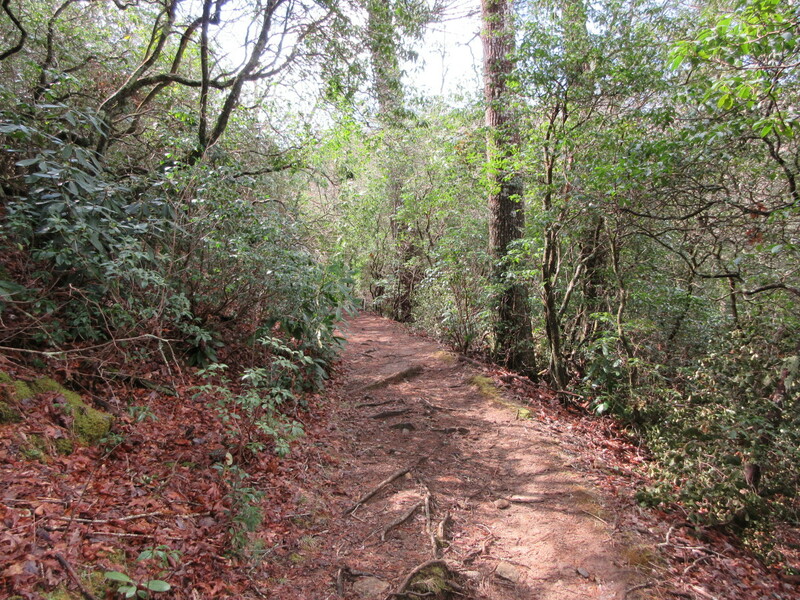 Place a chair or a marker near the top of the key. Coach sets up on the wing. Player starts on baseline with 2 balls. Player dribbles both balls at full speed to mid-court. Upon reaching mid-court players turns and attacks chair at full speed. 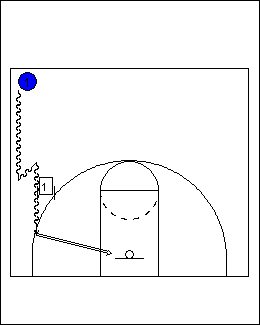 Before reaching the chair, player throws a 1 handed pass with the outside hand to the coach (or partner) on the wing. 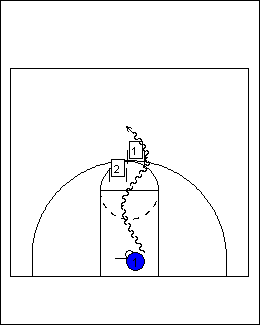 Player then makes a crossover dribble (or through the legs, behind the back, etc.) to go by the chair. 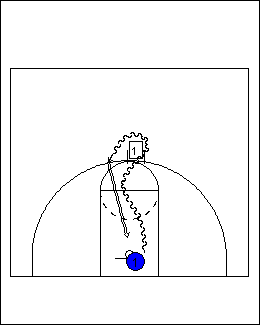 Once by the chair, player takes 1 hard dribble and pulls up for jumper. 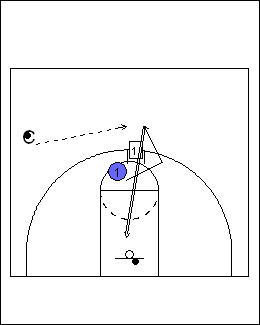 After shooting, player then cuts off the chair, as if cutting off a screen, receives pass from coach for second shot. Chair for second cut can be placed anywhere to simulate a cut off a screen for jumper. 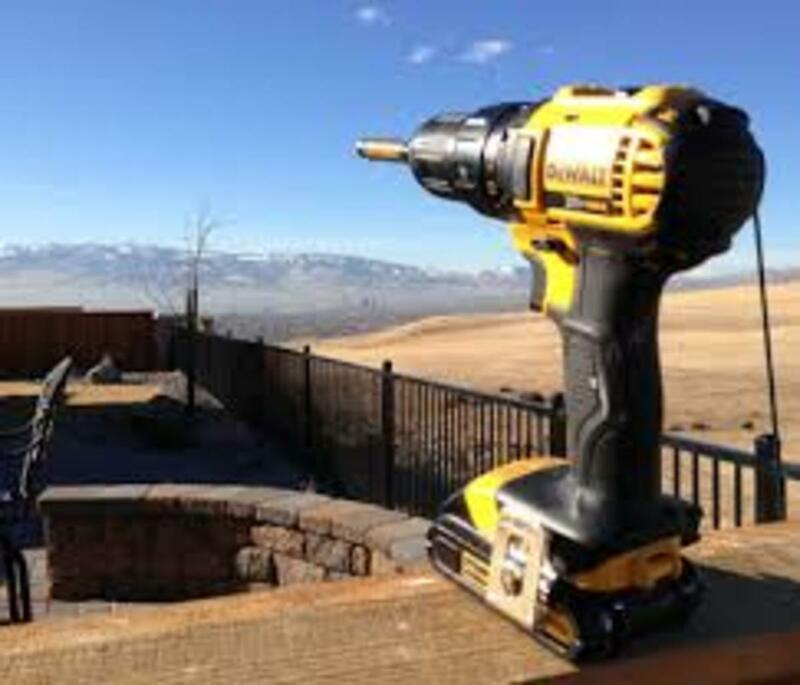 Drills can be monitored by, number of shots or number of makes. This drill addresses ball handling, handling under pressure, fast break, weak hand development and shooting on the move. Set chairs in the backcourt. Set as many as you like and space them as close or as far apart as you like, depending on the challenge you would like. Set a chair on the wing opposite the coach with a ball on the seat. Player starts on the baseline. Players dribble weaves through chairs. 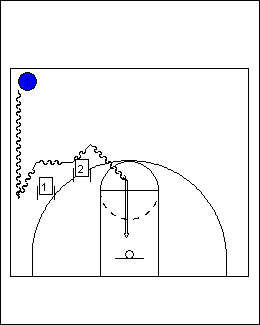 Upon clearing the last chair, player, throws a one-handed pass with outside hand to the coach. After pass to the coach, player makes hard cut and takes ball off the chair for jump shot. 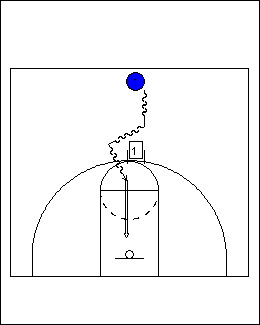 This drill addresses ballhandling and creating a shot. Set up chair near top of the key. Player starts at mid-court with the ball. Player attacks chair with his dribble. Upon reaching the chair, player makes a change dribble. 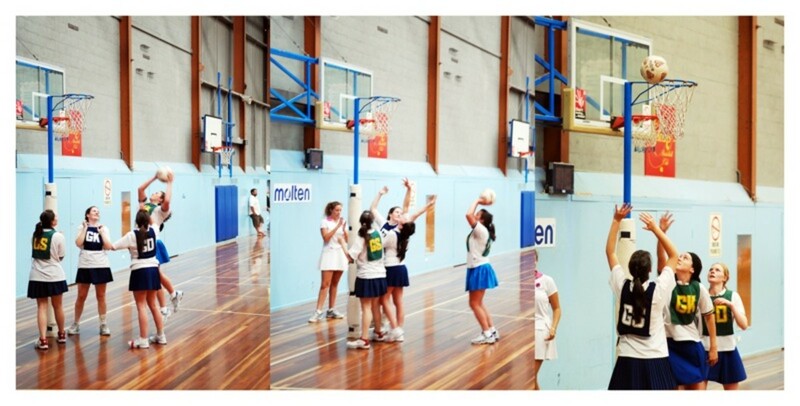 It can be a crossover, through the legs, behind the back, inside out, hesitation dribble. 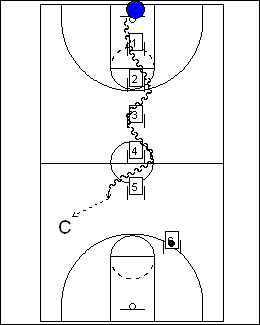 It can also be any type of combination dribble such as backup-crossover, crossover spin, etc. Make whatever type of dribble that will challenge you. 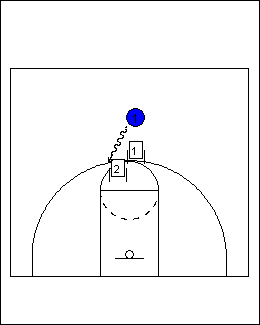 Upon passing the chair, player takes 1 dribble into jumpshot. Second level of the drill, set up a second (and then possibly a third) chair above the first one. Player challenges his ball handling as with the single chair drill. He can make the same dribble on each chair or change his dribble. 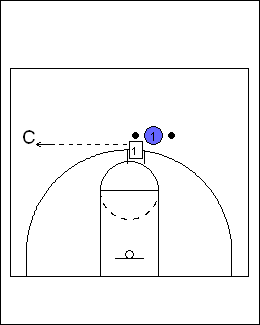 Once clearing the last chair, player takes 1 hard dribble for jumpshot. This drill addresses ballhandling, shooting, change of direction and escaping from traps. It is very effective when done at very high intensity. Set a chair near the top of the key. Player dribbles hard at the chair, making one or two changes on the way out. Upon reaching the chair he takes 2 more dribbles, 1 to get around the chair and 1 to get into his jumpshot. After shot player chases rebound (scores if he missed the shot) and immediately starts again. Drills can be monitored by time, number of shots or number of makes. On second phase of the drill, place a second chair inside the first chair. Player attacks the same way he attacked the single chair drill. When player dribbles around the first chair he then takes 1 dribble to attack the second chair. Player then takes a backup dribble as if to escape from a trap. 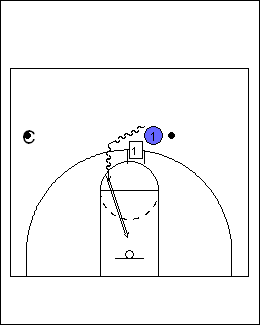 Player then makes a change dribble (crossover, through the legs, etc.) and takes another hard dribble to beat the chair and goes into a jumpshot. After shot, player chases rebound, scores if shot missed, and immediately restarts drill. 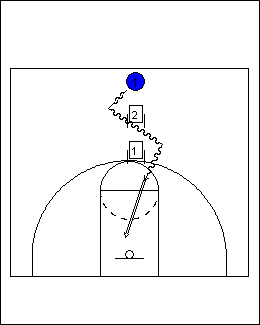 This basketball drill simulates a player using a wing screen. 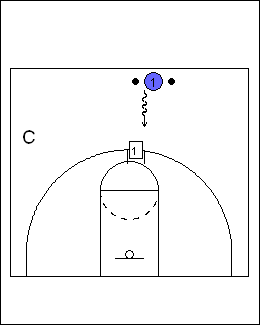 It addresses the ball screen, turning down the screen and beating the defensive hedge. Player starts with the ball at mid-court. 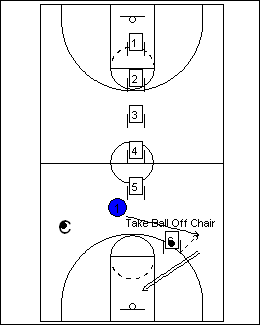 Set a chair on the wing in an area where the ballhandler might get a screen. Player dribbles down sideline. He should simulate dribbles he would use if under pressure. Change speeds, pony dribble, etc. Ball handler takes ball below the screen, change dribbles and explodes off the screen for jump shot. Player approaches the screen as in step 1. Player changes to go over the screen then changes to “turn down” the screen. He is simulating the defensive player anticipating the screen and beating the ballhandler over the top. Ballhandler “turns down” the screen to counter the defense. Ballhandler takes 1 hard dribble to separate off the screen for a jumpshot. Place a second chair above the first chair. This chair is in the “hedge” position. Player approaches screen as in step 1. 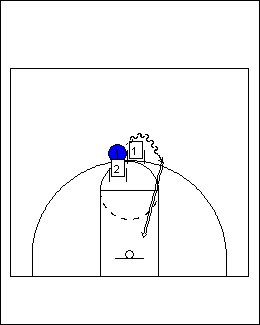 As he comes off the screen, the second chair simulates the “hedge man” on defense. Player attacks the hedge man and uses an angled dribble to try to “drag” the hedge man away from the screen and create a switch. Player then changes and attacks with a hard dribble for shot. Of course there are many other basketball drills and tips for point guards to improve their game. We can't include all those drills and tips in one single hub. I urge you to keep learning and practice, practice, practice! I also invite you to check out our other hubs and our own website with information about basketball drills and skill building. Wonderful and well written article. Anyways, These are awesome Drills... Shooting is life! Good drills. Except isn't the key that half circle thing at the bottom of the basket? You said to put the chair there but on the picture you put them above the freethrow line. U guys are very dumb if you don't know what a jump shot is!! Why are u doing basketball if u don't know?? How much reps should we do of this drill!!! Great hub , very good and informative. How much shots should we make on each drill??? P.S. I have back problems so feel bad for me if u want too. How good are these drills....can they make my team the best? Comment back. P.S. Bob i am wondering the same thing! haha. Do these drills really work? These are great drills. I use these drills with my team and they are the best team in the state right now. These are great drills that can help anyone who would like to become a better ballhandler and player. Thanksss. ill showw these to my coach.! Great drills, I want to train as a pointguard. Cool drills. Im a pointguard but I only have a small out-door court to practice on. I guess I can do #3, but that's it. Thanks! a jump shot is when you shoot. have one had under the ball, one on the side. bend your legs and keep elbow in while following through.